The first Boston Marathon, America's first annual race, took place on Patriot's Day, April 19th 1897. Fifteen runners participated that day, while nearly 20,000 runners take part in the race each year today. A marathon is a human foot race, with each person competing to cover a distance of 26 miles 385 yards (the Olympic standard). The race starts in Hopkinton Massachusetts and ends in Boston's historic Back Bay. This Year's Marathon is on Monday April 15, 2019. At Hopkinton, Push-Rim Wheelchair Start Time is 9:17 am, Hand Cycle Start is 9:22 am, Elite Women Start is 9:32 am, Elite Men & Wave 1 Start is 10:00 am, Wave 2 Start is 10:20 am, and Wave 3 Start is 10:40. The highest skilled male runners dash across the finish line in the Bay Bay around noon, or in just over 2 hours after the race started. The Boston Marathon has great tradition. For 89 years, the winner of the marathon received a gold and diamond medal. It was not until 1986 that runners received prize money. A laurel wreath, made of leaves imported from Greece, is placed on the head of the winner in each category (Men's and Women's Open, Masters, and Wheelchair categories). Other traditions include runners passing through a somber old burying ground in Hopkinton, a huge pasta party for the runners before the race to gain carbohydrate fuel, and a beef stew dinner after the race. A recent tradition is the Kenyan runners visiting local school children before the race. The first official female winner of the Boston Marathon was not until 1972. Wheelchair racing started in 1995. 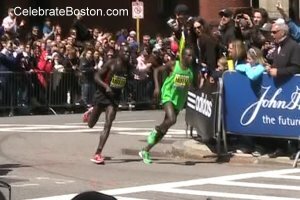 The fastest male runner, Geoffrey Mutai of Kenya, completed the race in 2011 at 2:03:02 (wearing green in photo). The fastest female runner, Bizunesh Deba, completed the course in 2014 at 2:19:59. Heartbreak Hill, the infamous hill in Newton that strains the runners, was given its name in 1936. The defending champion, Johnny Kelly, caught up to Ellison "Tarzan" Brown on this hill, and believing he would win, tapped Brown on the behind. The gesture inspired Brown, who eventually overtook Kelly and won the race. A "heartbreak" for Kelly, and a spirited rivalry indeed. The race takes place each year on Patriot's Day weekend. Patriot's Day commemorates the anniversary of Paul Revere's Ride, and the subsequent Battle of Lexington on April 19th 1775. The Boston Marathon is sponsored by the Boston Athletic Association. Established in 1887, the association celebrates the positive values gained by participation in sports. Of obscure interest, remnants of the old Walkway of the Running Stars are still visible on Massachusetts Avenue for fans of Marathon History and folklore. When did the first true marathon take place? At the 1896 Olympics in Greece. The footrace of the Ancient Olympics was only about 5 kilometers. The modern marathon is named after the Battle of Marathon that took place in 490 BC.